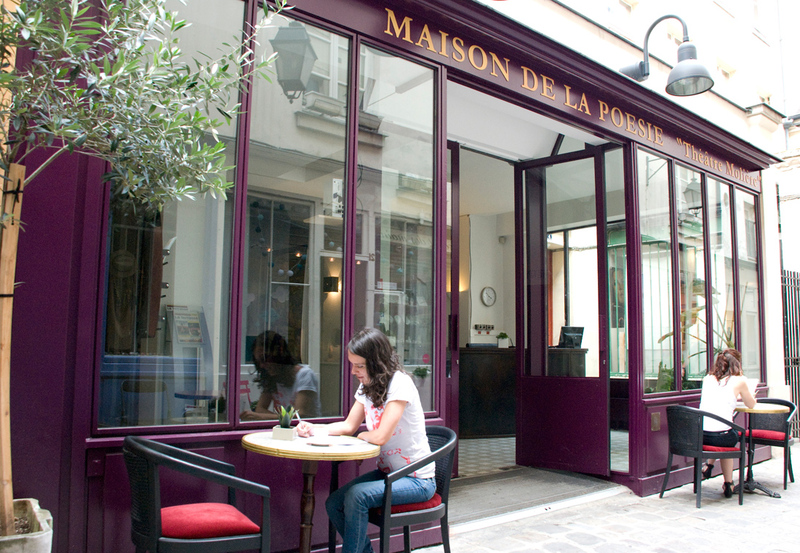 Though I have been attending English-language poetry events, particularly on Thursdays in Belleville and once a month just off the Rue de Rivoli, I’ve been eager to orient myself in contemporary French poetry. 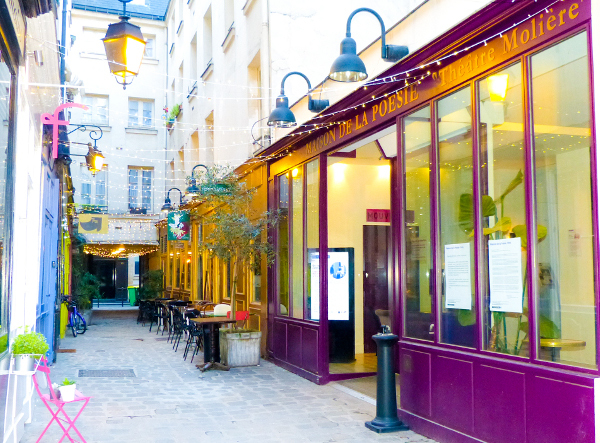 A good place to start is just a stone’s throw from the Pompidou, off the rue Saint-Martin, in the wonderful Passage Molière. 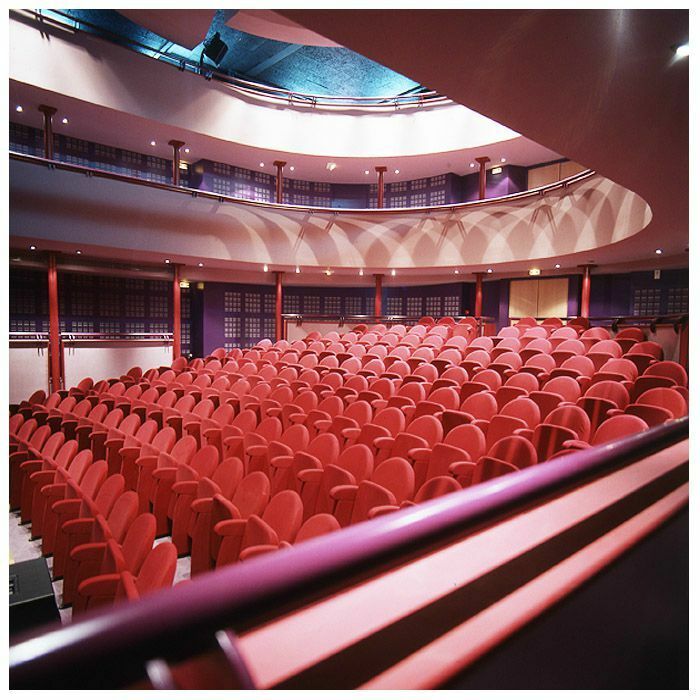 I have become a member of the Maison de la Poésie where most nights there are readings, lectures, concerts and performances in its small theatre tucked away inside. I attended a really fascinating evening celebrating 20 years of Flammarion‘s poetry list, which is headed up by Yves di Manno, who, since 1994 has published some 50 contemporary poets and their 120 books. This anniversary event featured readings by Patrick Beurard-Valdoye, Bernard Chambaz, Marie-Louise Chapelle, Marie Etienne, Sandra Moussempès, Nicolas Pesquès and Sophie Bourel. Poems that journeyed to Eastern Europe, the Soviet Union, Vietnam, poems as travels in sound and dislocated language, poems read to slowed-down archive film of children playing, poems as hypnotic performance of son et lumière. I really enjoyed the experimental work by Sandra Moussempès, who plays with voice and music to produce a hypnotic performance that reminded me of British poet Hannah Silva, with hints of Bjork, such as here. I spoke to the poet afterwards and it turns out she once lived in Stoke Newington and as a 12-year old girl stayed with Ted Hughes! I also chatted to the amazingly well-travelled and prolific Marie Etienne who was charming and recommended I absolutely read La Quinzaine Littéraire, which I can since attest to, its articles well-written and thankfully more concise than those in the LRB. My favourite poems of the evening were by the young poet Marie-Louise Chapelle, who does not enjamb! Her work was quite unique on the ear, a convolution of words, delivered in a staccato manner. The poems swim around the page, some small islands of words in a sea of white space, others in a two column form, themselves looking like two pages of a book. You can hear her reading in 2010. Her poems don’t have titles. This is page 69 from her second book ‘Prononcé second’ (Flammarion 2010). 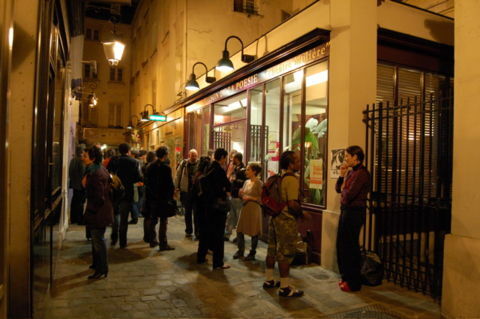 One of the nice things about the Maison de la Poésie is the little bar area. After the readings you can sample young red and white wines and the place lays on plates of cheese and charcuterie, or there are charming little restaurants with terrasses in the Passage on either side. I went back a week later to see singer-poet Raphael read poems by Rimbaud, Villon, Kerouac, Bukowski, and then sing from his three albums, playing in turn on four different guitars. I discovered his music a few years back when I was living in Lille. He has a cheese-gratery, melancholic yet soothing voice in his best songs such as Caravane, Et Dans 150 Ans, Ne Partons Pas Fachés, Schengen and Le Petit Train. “It makes no sense to speak of contemporary French poetry—except in the sense that, increasingly, all literature that doesn’t fit into any other category gets called poetry, a trend I highly champion, as it broadens the definition of the art. And that’s also what contemporary French poets are doing: broadening the definition of la poésie to include and encourage an ever-diversifying array of approaches and forms. The one constant is exploration, and much of that is eroding the boundaries of the genre, of genre itself, and even of media. I feel very envious listening to the recordings and seeing the life in the street.